To a certain extent Iässt sjch the importance of the village in the 16th century Grötzingen understand at the town hall building, the predecessor of the present building dating from 1583, of which, after 30 years of war, only the stone base survived, had already the same size as the later established and still preserved structure. Its size indicates a mature and prosperous community that could not afford a representative Town Hall for administration and council meetings. The location between Central district and Pfinz and along the roads to the other districts underlined his position. 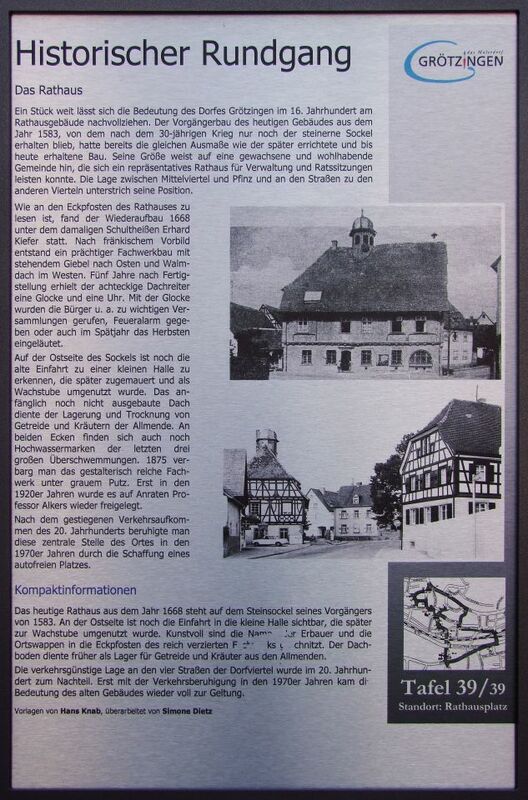 As you can read on the corner posts of the town hall, the Wiederautbau found in 1668 under the then mayor Erhard Kiefer instead. After the Frankish model a magnificent timber-framed building with standing gable and hipped roof to the east in the west originated. Five years after completion of the octagonal roof riders got a bell and a clock. With the bell the Bürgeru.a were called to important meetings, where fire alarm or also ushered in the autumn in late year. On the east side of the base is still the old driveway to see a small hall, which was later bricked up and converted as a guardroom. The anfäng1ich not yet developed roof served the storage and drying of grain and herbs of the commons. Be found at both corners still high water marks of the last three major floods in 1875 hid one of the visually rich truss under gray plaster. Only in the 1920s was exposed on the advice of Professor Alkers again. After the increased traffic of the 20th century, calmed this central office in the place in the 1970 years by creating a pedestrian square.